(Toronto, Ont.) A new era has begun in the rich history of Canadian wheelchair basketball. Mike Frogley, one of the brightest minds in the sport, officially begins his tenure as the director of the new groundbreaking Wheelchair Basketball Canada Academy set to formally launch in September 2013. “It’s really great to get on the court and begin working directly with the athletes because at the end of the day we are tying to leverage all of resources within Wheelchair Basketball Canada to maximize the potential of all our athletes. It’s about making them the best in the world,” said Frogley. “What’s neat about my first day at the Academy is that we know things are continuously evolving. The Academy will look different today than it does a year from now. And while we may not necessarily know exactly what things will look like in three years or five years, what we do know for certain is that we have taken the first step. We know that the Academy is a journey that ultimately goes up one step at time and that ends with our athletes reaching top of the podium,” said Frogley. Beginning in September, a handpicked selection of elite Canadian wheelchair basketball athletes will train year-round at the Academy under the expert tutelage of Frogley to further their development along the high performance pathway, with hopes of one-day representing Canada at the World Championships and Paralympic Games. The Canadian Junior Men’s National Team will centralize at the Academy from July 28 to August 14 for a phase of rigorous training as Team Canada prepares to compete at the 2013 World Junior Championship in Turkey this September. From August 9-14, the Academy will host an athlete identification camp for select athletes with the potential to participate in the Academy program. Athletes attending the camp will have the opportunity to train and receive elite instruction from the Academy staff. Frogley began playing wheelchair basketball following an injury from a car accident in 1986. He made Team Canada in 1989 and competed at the 1992 Paralympic Games in Barcelona, Spain, placing fourth. Frogley served as the head coach of the Canadian Senior Men’s National Team from 1996-2004. He guided Team Canada to Paralympic supremacy for the first time in program history with back-to-back gold medals in 2000 and 2004, as well as a Paralympic silver medal in 2008. 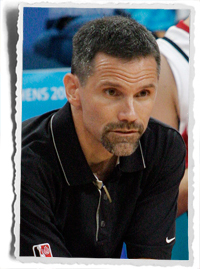 He was also an assistant coach in 2006 as the Canadian men won their first World Championship title.